Most of you want him to write a song for you and sing it, that is so romantic! 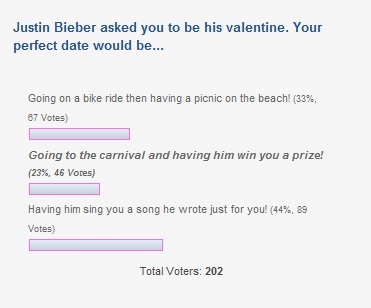 33% of you would love to go on a bike ride and then have a picnic at the park, and 23% of you girls would love to go to the carnival and have JB win a prize for you! Don’t forget to vote on the poll of this week about meet and greets! I LOVE the game DRESS UP NICK JONAS AND HE’S SO CUTE IN IT 3X! OMG i luv u JB!!!!! i like listen to u every day!!!!! I would love to go on a date with Justin Bieber. He is so cute and adorable!!! nie ,,,bnrn gx cei .. I <3 U JB!!!!!!!!!!!!!!!!!!!!!!!!!!!!!!!!!!!!!! !I AM UR BIGGEST FAN!!!!!!!!!!!!!!!!!!!!!!!!!!!!!!!!!!! Justin Bieber I love you!!! TE AMO JUSTIN BIEBER SOS MI AMOR SOPS RE LIUNDO TE RE- QUIERO MUCHO SOS ERMOSO SOS SOLO MIO MUYCHOS BECHOSSSSSSSSSSSSSSSSSSSSSSSSSSSSSSSSSSSSSSSSSSSSSSSSSSSSSSSSSSSSSSSSSSSSSSSSSSSSSSSSSSSSSSSSSSSSSSSSSSSSSSSSSS!!!!!!!!!!!!!!!!!!!!!!!!!!!!!!!!!!!!!!!!!!:)!!!!!!!!!!!!!!!!!!!!!!!!!!!!!!!!!!!!!!!!!!!!!!!! :) :) !!!!!!!!!!!!!!!!!!!!!!!!!!!!!!!!!!!!! :) !!!!!!!!!!!!!!!!!!!!!!!!!!!!!!!!!!!!!!!!!!! !=) =) =) =) LOVE !!!!!!!!!!!!!!!!!!!!!!!!!!!!!!!!!!!!!!!!! !FOR EVER!!!!!!!!!!!!!!!!!!!!!!! !